Whether your the oldest, the youngest or somewhere in-between, nothing screams siblings quite like a rivalry. Be it the better grades, who gets away with more stuff or who gets to watch what they want to watch, it is always a battle. For these two, it was about exchanging each other for Christmas gifts. With the fall sun just above the late afternoon horizon , this family session produced some great shots. The orange leaves in the tress behind speak to the time of the year and the signs they are holding tell of the upcoming season. With a mix of open light and shade in the backyard, I chose to put the kids just barely in the shade, preserving a little of the sunlight to put a glow on their hair. I positioned my light just slightly to their right, creating a stream of light that matched the warmth of the light behind them. 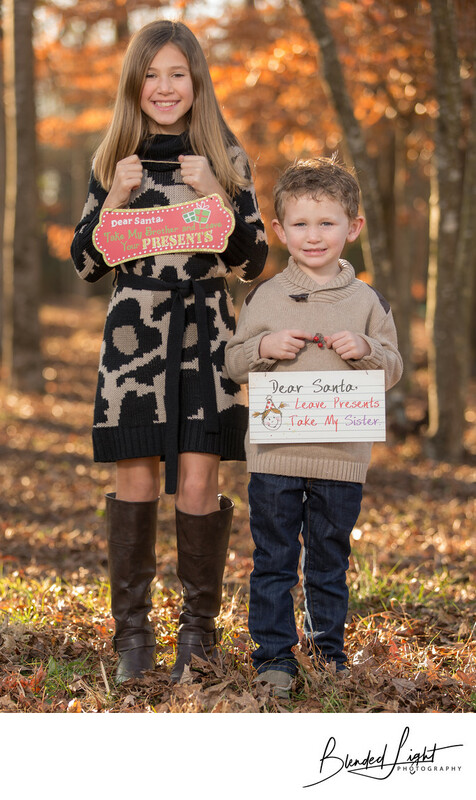 With a count of three, I got some great smiles in the image for Christmas cards. If you're wondering about props, I always suggest Hobby Lobby. Not only are they a great company and great corporate citizens, if you can't find something creative there, it's probably not made! 1/80; f/3.2; ISO 50; 105.0 mm.